For those not in the know, fusing a rigorous minimal concept with the power of a rock band, Sonar have quickly gained international reputation for their uncompromising sound. With their slow-build approach to dramaturgy and avoidance of conventional forms, they focus on the deep interactions between members Stephan Thelen (guitar), Bernhard Wagner (guitar), Christian Kuntner (electric bass) and Manuel Pasquinelli (drums). Just released, Live at Moods (out now via 7D Media) is their fifth release and has them partnered with guitarist, composer and producer David Torn. Vortex, their previous album with Torn, blew heads open with its rare blend of seductive chemistry and sonic shards and thus these six live tracks - recorded at Moods Jazz Club in Zürich, Switzerland, on May 24th, 2018 - showcase all that energy, all that passion, all that desire just perfectly. The tight precision work of the 12 minute opener 'Twofold Covering' bleeds seamlessly into freshly alive 'Waves & Particles' ensuring that what you are hearing are a collective ensemble of musical wonderment that smoothly conjoin to both compliment and amaze. 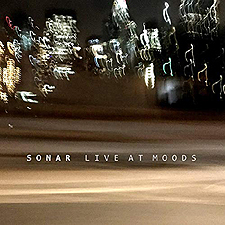 In closing, the stylistic blending of Sonar's precisely structured, polyrhythmic rock music and David Torn's freely improvised, raw and emotional guitar interjections - a trademark of Sonar's 4th album Vortex - is now continued here within this amazing new album, Live at Moods.